Welcome to a thematic workshop by the Lund Institute of Advanced Neutron and X-ray Science (LINXS) with leading experts in the field of bio-macromolecular dynamics, with a particular focus on neutrons, X-rays, and complementary techniques including NMR and computer modelling. This workshop addresses the important area of bio-macromolecular dynamics, and aims at bringing together leading scientists from different fields such as soft matter physics, biology and pharmaceutical sciences, with expertise in experiments, theory and computer simulations. Discussions will be centered around progress in our ability to characterize and understand internal conformational dynamics of proteins such as large-scale domain motions for globular proteins as well as more complex shapes such as antibodies and intrinsically disordered proteins, short and long time diffusion and internal motion of proteins in crowded environments, and the use of this knowledge for drug discovery applications. While the use of neutrons and x-rays and the development of novel methodology is in the focus of the workshop, it will also feature other, complementary experimental techniques. 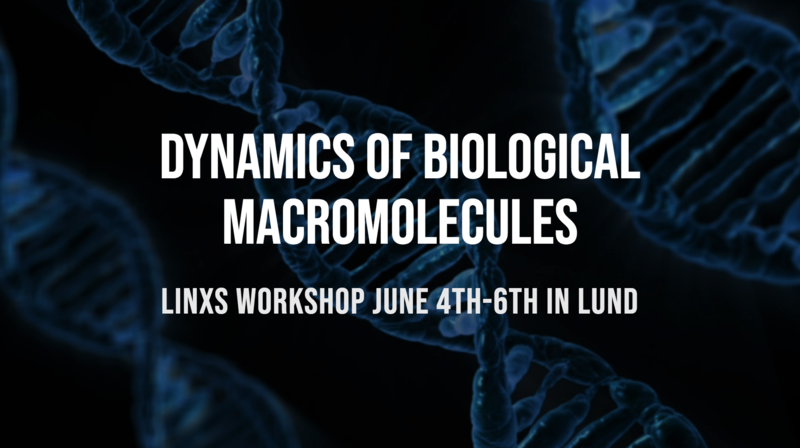 The workshop of Dynamics of Biological Macromolecules is a part of the thematic activity on dynamics of the recently founded Lund Institute of Advanced Neutron and X-ray Science (LINXS) of Lund University. The mission of LINXS is to promote science and education focusing on the use of neutrons and X-rays, to attract world-leading scientists for short- and long-term focused research visits, and to create international networks in this area.